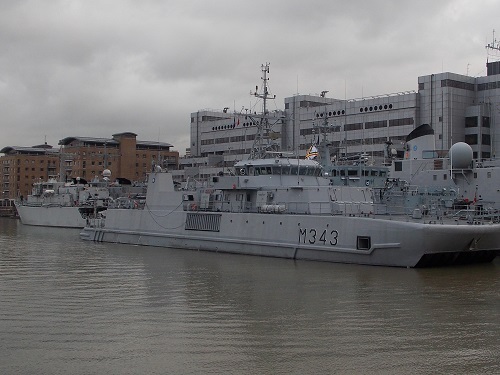 After the excitement of the arrival of the HMS Grimsby (M108) ,BNS Godetia ( A960 ), Latvian Navy ship Tālivaldis (M-60), the Estonian Navy ship EML Admiral Cowan (M313) , the Norwegian Navy ship Hinnøy (M343) and the Dutch Navy Ship Schiedam (M860) last week. It is worth looking in a little more detail into what these ships of Standing NATO Mine Counter-Measures Group ONE (SNMCMG1) are used for. The Standing NATO Maritime Groups, are a multinational, integrated maritime force made up of vessels from various allied countries. 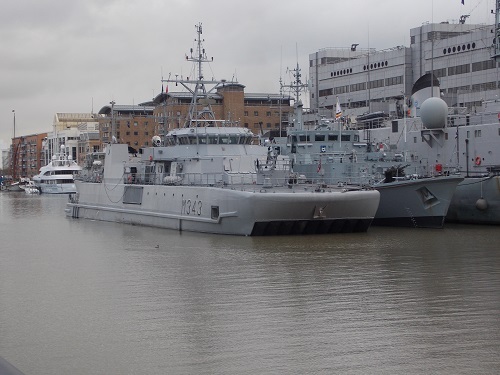 These vessels are permanently available to NATO to perform a variety of tasks ranging from participating in exercises to intervening in operational missions. 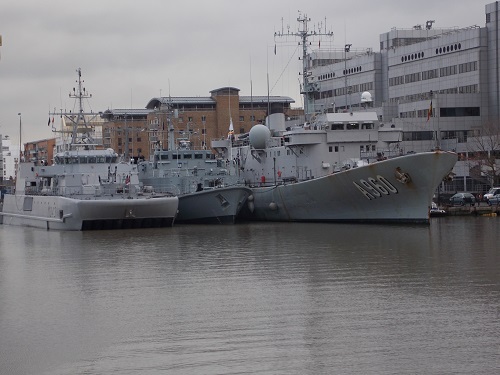 These particular ships have recently taken part in the NATO exercise, Trident Juncture which was considered one the biggest and most ambitious NATO exercise in more than a decade. It was estimated that 68 surface ships, 9 submarines, 8 maritime patrol aircraft and over 3000 Marines participated in the exercise. 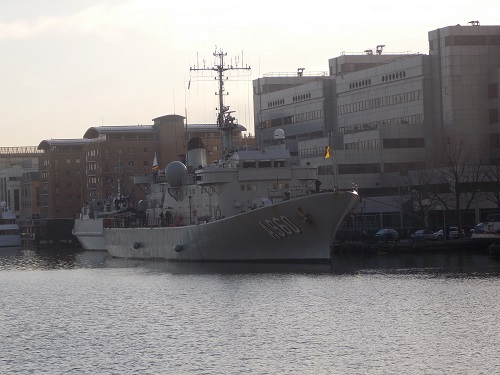 As well as the exercises, the SNMCMG1 ships and crew have been engaged in a port visits and mine clearance operations in order to contribute to NATO collective defense and regional security. 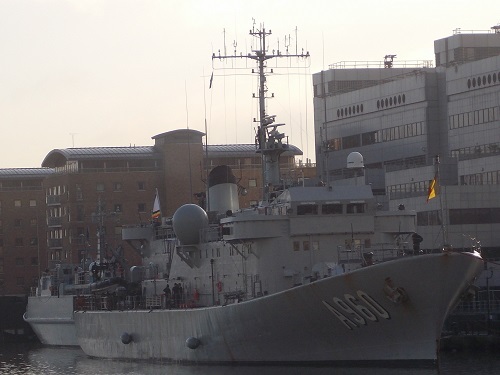 Although the port visits are relatively low key, they do provide evidence of the way that NATO bring together ships of different countries for maritime security and show NATO’s readiness in the region. Over the last year, the SNMCMG1 ships have visited 33 ports of 13 different nations. 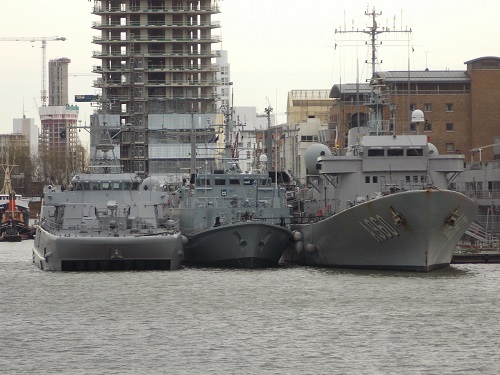 After a fairly quiet spell in West India Dock, a small flotilla of six NATO ships berthed. 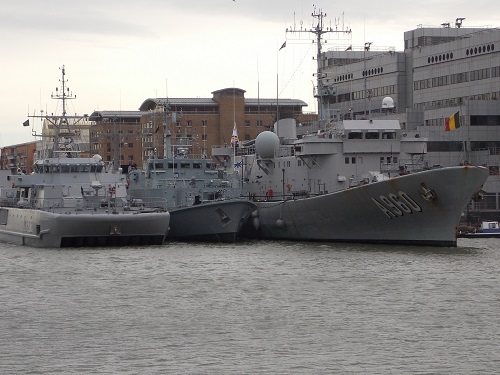 HMS Grimsby (M108) and BNS Godetia ( A960 ) arrived this morning to be joined by the Latvian Navy ship Tālivaldis (M-60), the Estonian Navy ship EML Admiral Cowan (M313) , the Norwegian Navy ship Hinnøy (M343) and the Dutch Navy Ship Schiedam (M860). The Tālivaldis built in the Netherlands in the 1980s like the Schiedam. 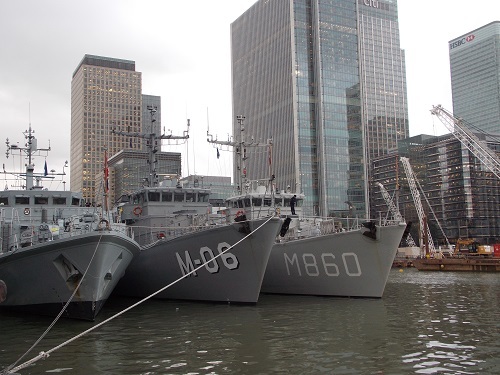 They are known as Tripartite Minehunter because they were a joint venture of the navies of France, Belgium, and the Netherlands, the Tripartite class of minehunters were conceived in the 1970s and built in the 1980s. 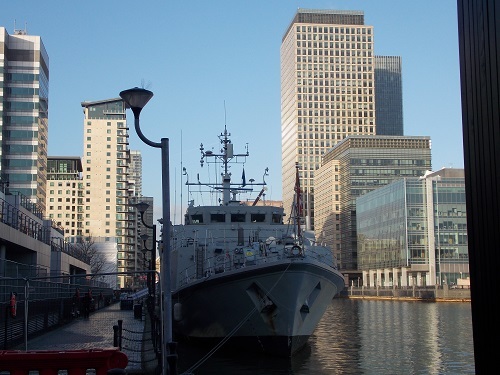 The EML Admiral Cowan (M313) is a Sandown-class minehunter like the HMS Grimsby and was known formerly as the HMS Sandown before she was sold to the Estonian Navy in 2007. The Norwegian ship Hinnøy (M343) is one of the Oksøy-class mine hunters which are a class of vessels of the Royal Norwegian Navy active since the mid-1990s. 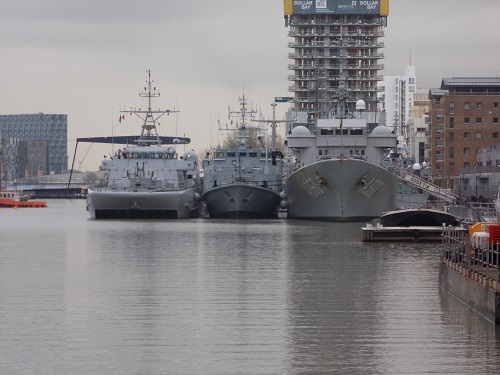 These small flotilla’s have turned up in West India Dock over the last few years, quite often it is when they have just finished an exercise. They do not tend to be open to the public and with all the development on the area, most of the quayside is blocked off. 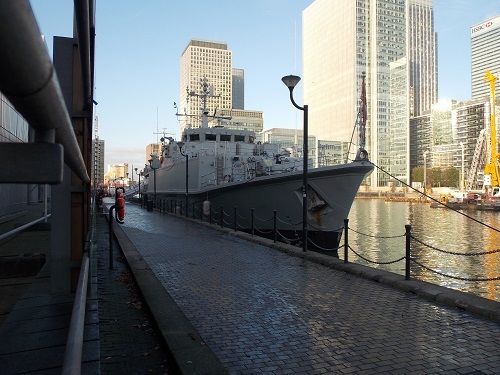 However a good view of the ships can be had on the Canary Wharf side of the dock. As usual, regular contributor Eric Pemberton was quick off the mark, getting a few photographs of the ships entering the docks. 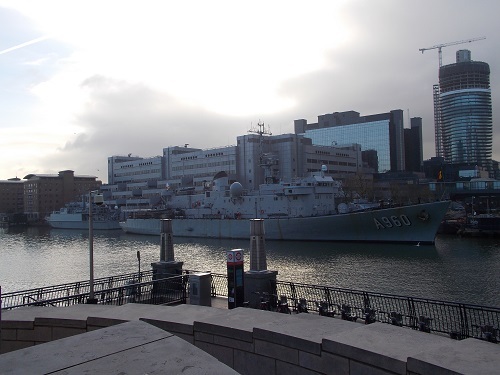 Two surprise visitors in West India Dock are the Belgian Navy ship Godetia and HMS Grimsby of the Royal Navy. 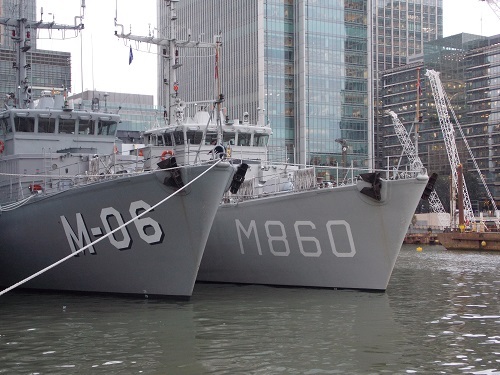 Both ships have been involved recently in NATO exercises in Northern Europe and are part of the SNMCMG 1 (Standing NATO Mine Counter Measures Group 1). 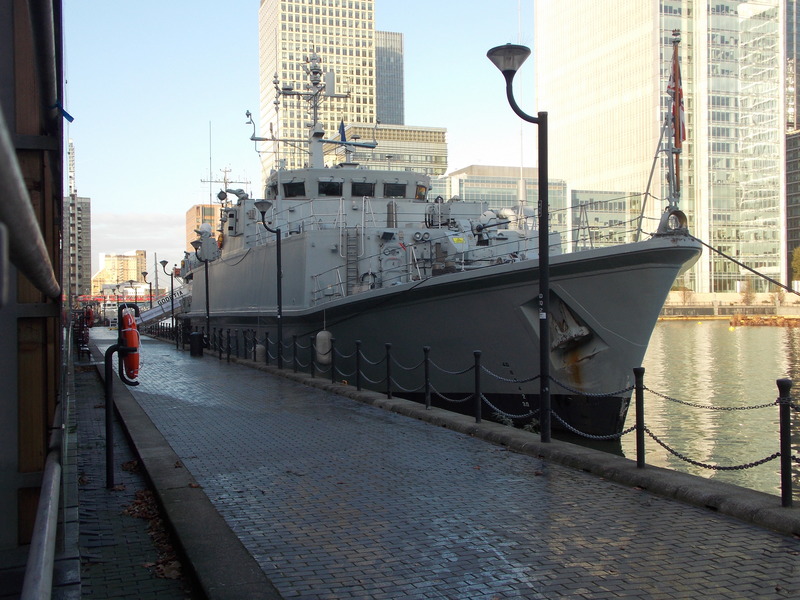 The BNS Godetia last visited the West India Dock in 2012 as part of a small Nato fleet. 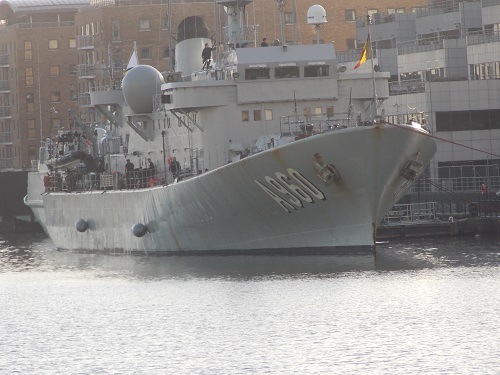 The ship is a command and logistical support ship and often features in NATO exercises. The ship has a length of 91.30 m (299.5 ft), 14.00 m (45.93 ft) beam and carries a crew of around 90. 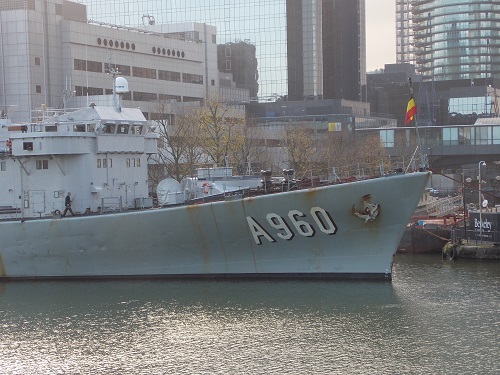 The Godetia is one of the oldest warships on active service being launched in 1965 at the Boelwerf in Temse. During her long career, the ship has undertaken several missions including fishery protection, humanitarian aid, support and supply ship for minesweepers, and acting as a command ship for NATO mine countermeasure operations. Slightly dwarfed by the Godetia is HMS Grimsby which is a Sandown-class minehunter which was launched in 1998. 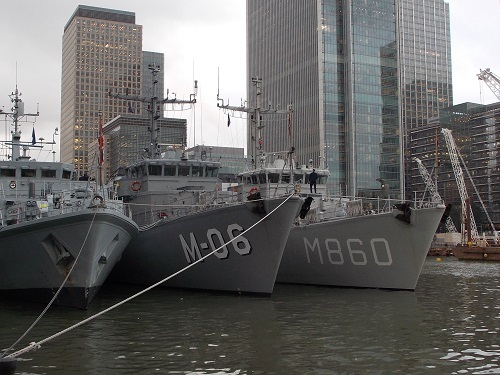 The Royal Navy minehunter regularly exercises with her NATO counterparts in a number of activities such as mine clearance exercises and maritime security patrols. The ship has a length of 52.5 m (172 ft 3 in), beam of 10.9 m (35 ft 9 in) and a crew of around 35. Due to the surprise nature of the visit, little is known at this time of how long the ships will be in dock. 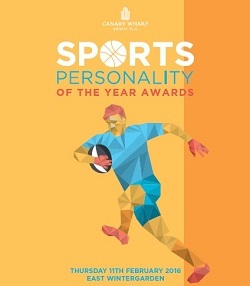 East London has a remarkable record of producing sporting greats in the past, however the Canary Wharf Group has recently launched its annual Sports Personality of the Year Awards to search for the current top sporting talent in our East London community. 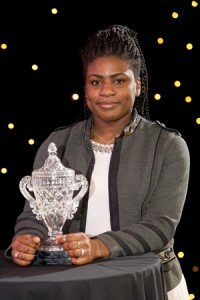 The awards are asking for nominations from members of the public for deserving local athletes, sports clubs and administrators for their achievements in the previous 12 months. Applications will be considered from Tower Hamlets and each of the boroughs surrounding it, including Hackney, Newham, Greenwich and Barking & Dagenham. Entries close on the 18th December 2015. 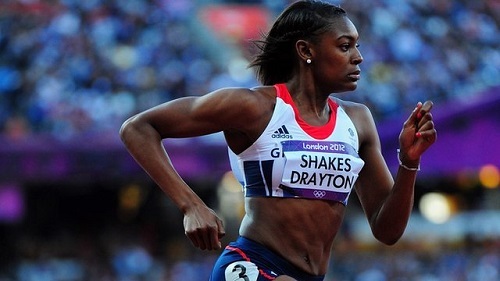 The 2012 Olympics provided a major boost for East London sport but away from all the glamour, it is often unsung hard work of the athletes, sports clubs and administrators that keeps the various sports going. It is this hard work that these awards celebrate, so if you wish to nominate someone, you can find the nomination form here. 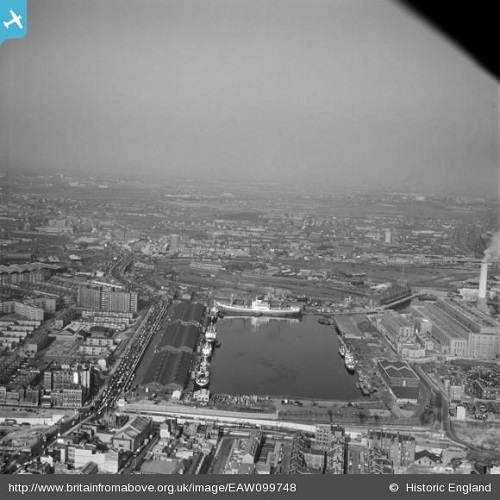 The above picture from regular contributor Eric Pemberton was a reminder to tell the story of the Brunswick Wharf Power Station, it was for a short time between the 1950s and 1980s one of the most prominent landmarks in this part of London. The Brunswick Wharf Power Station was first conceived just before the war in 1939, it was part of a scheme to build five new generating stations in the South East region. Poplar Borough Council was keen to see a local power station in this area and informed the Central Electricity Board that the PLA was willing to sell a 16½ acres site at Blackwall. 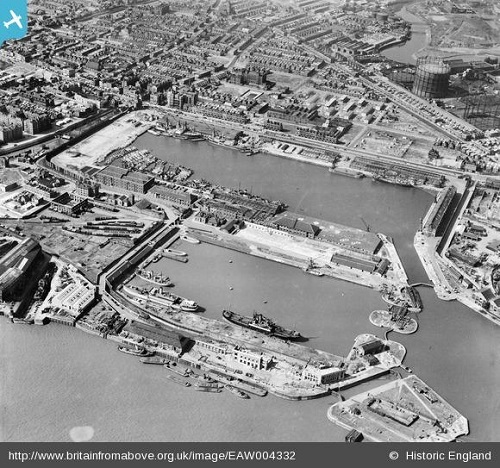 The plans were for the new station to be built on the site of the East India Export Dock, with Brunswick Wharf providing a frontage to the River Thames. Its was considered the site had a number of advantages, there was an abundant supply of water for condensing purposes, deep-water berthing facilities, plenty of space for coal storage, facilities for the disposal of ashes and good rail links. For all the advantages, there were objections, the London County Council was concerned about pollution and the Civil Defence Department of the Home Office and the Air Ministry both made strong objections on strategic grounds feeling that the construction of a new generating station in the docks area would be vulnerable to attacks. Despite the objections, the decision was made in 1945 to purchase the land and build the power station. The difficulties of the post war years led to delays and it was not until 1952 that the station began to supply electricity, and was not fully completed until 1956. 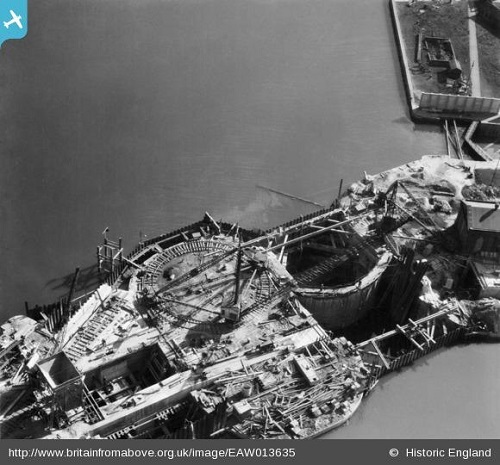 Photographs from the Britain from Above website show the construction including the filling in of the East India Export Dock. 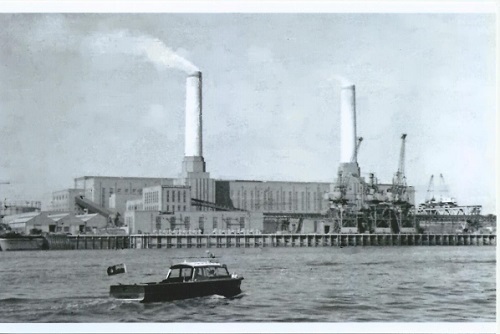 The design for the power station was very similar to Giles Gilbert Scott’s at Battersea Power Station which seemed a rather attractive but dated design for a modern power station. The boilers were designed to be fired by coal, .It was estimated that each boiler consumed 36,700lbs of coal per hour. 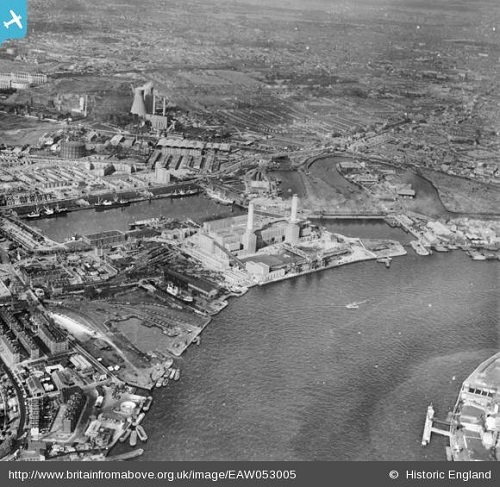 The Brunswick Wharf Power Station had a relatively short working life but became a landmark for the area. 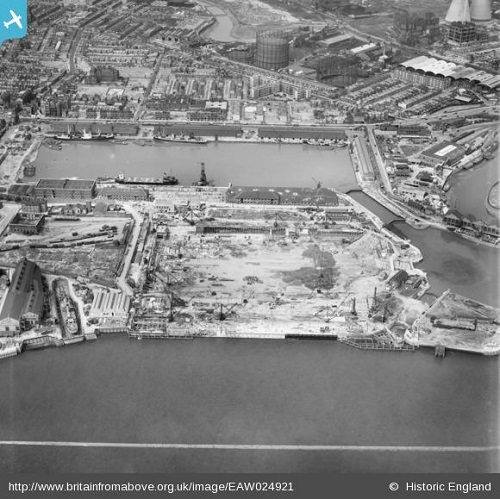 It is interesting to remember that the site of the Power station was not only on top of one of East India Docks but also covered the site of the Blackwall Yard which had been famous from the Tudor times. 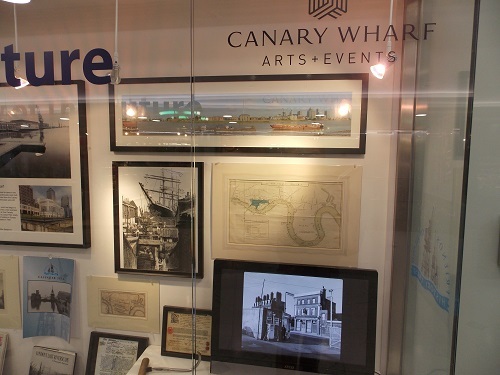 Walking through the Canary Wharf shopping area, I was delighted to come across an attractive and interesting display about the ‘Islands’ history. 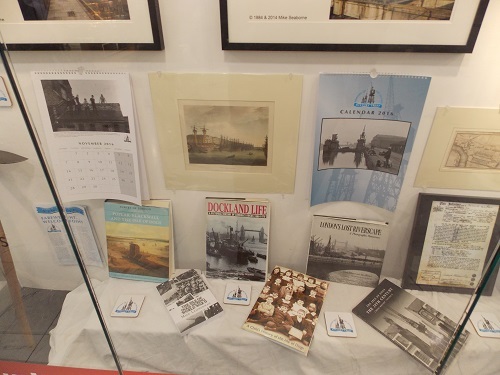 The Community window gives a snapshot of some of the work of The Friends of the Island History Trust. The Friends of the Island History Trust succeeded the Island History Trust project which was responsible for collecting photographs, ephemera and relevant historical information about the Island under the stewardship of Eve Hostettler. 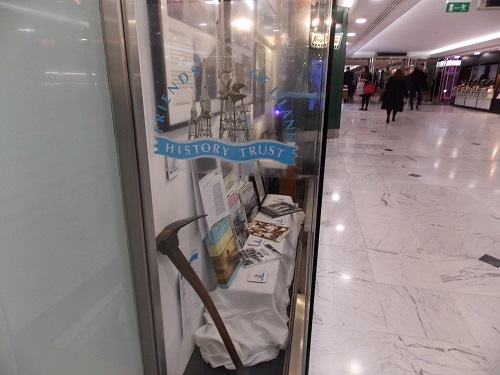 The Friends of the Island History Trust has already had series of Open Days and are in the process of creating a website that will provide photographs and information to local people but also interested people in the UK and from all over world. 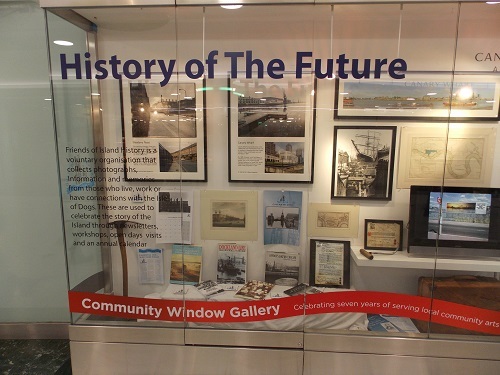 The Community window in Canary Wharf which will be displayed until January 6th 2016 is part of the aim for people living, working and or visiting Canary Wharf to understand some of the remarkable history of the area. An important focus for the new group is getting people who live and work in the area, new and old Islanders and especially young people involved to celebrating their own part in the story of the Isle of Dogs. The group has developed links with volunteer Students of George Greens and The Volunteers of the Massey Shaw Educational Trust in a project with them taking part in joint visits to the Educational Fire Boat by a mix of volunteers from both the School and Friends of Island History Trust next year. 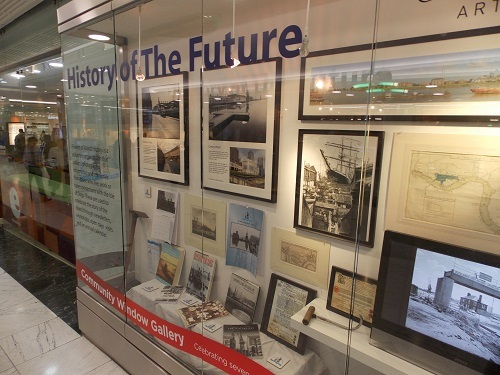 The Friends of the Island History Trust are also looking into developing the use of Heritage Display Boards which are based around the Dock area and around the Island in an exhibition/walk early next Spring. They have also reproduced 200 copies of Mick Lemmerman’s excellent book ‘The Isle of Dogs During World War II’ which is on sale through FoIHT for £11.00 plus postage. 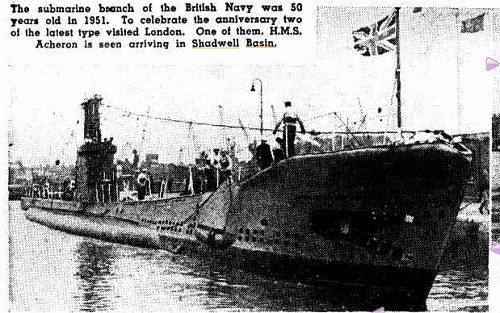 Whilst researching the Pamir in Shadwell Basin article, my attention was taken with a Pathe News report of a couple of Royal Navy submarines to the Basin in 1939. 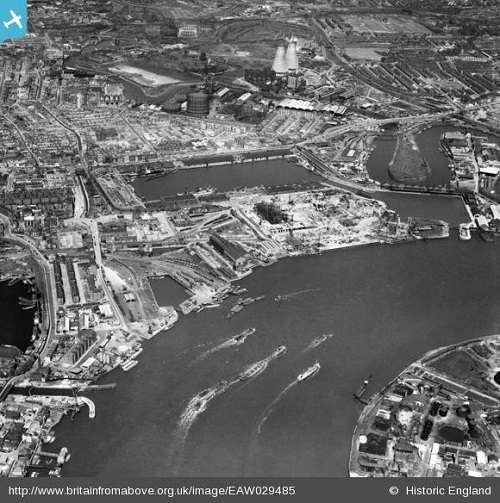 For all the ships that come up the Thames to London, it is very rare a submarine makes the journey. 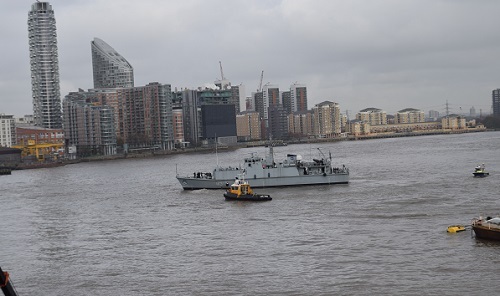 That is why, when a Dutch submarine come into West India Dock a couple of years ago it created quite a bit of attention. 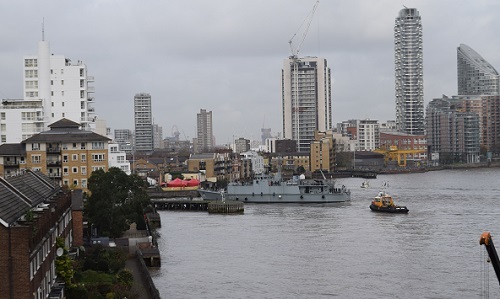 Local writer Alfred Gardner also remembers a couple of submarines after the war arriving in Shadwell Basin and quite a number of local children were allowed to look inside and tour the boat. The visit in 1939 involved the Royal Navy submarines, HMS Otway and HMS Osiris. 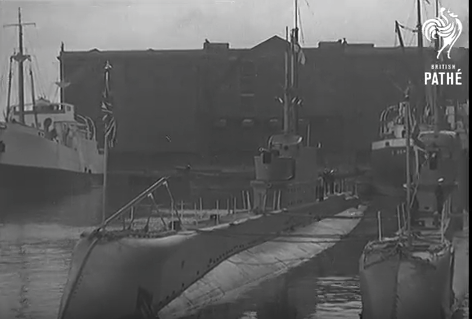 The short film shows the submarines on the Thames near Wapping and shows one of the submarines entering the Basin and moving to its berth. Both the submarines seem very different to the more streamlined modern models. The HMS Otway was a Odin-class submarine built by Vickers Limited of Barrow-in-Furness and launched in 1926, she was actually built for the Australian Navy and made the trip to Australia setting the record for the longest unescorted voyage undertaken by a British submarine. However the cost of maintaining the submarine led to the Australians giving them back to the Royal Navy . 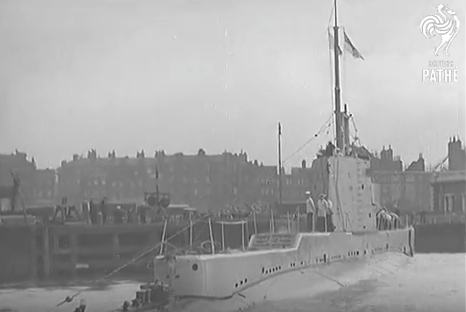 Although expensive to operate the HMS Otway did see service during World War II , after the war the submarine left RN service in 1945 and was broken up in Scotland. The HMS Osiris was also a Odin-class submarine of the Royal Navy and built by Vickers-Armstrongs in Barrow-in-Furness and launched in 1928, in 1939 she was sent to the East Indies Station in Colombo. By 1940 she was transferred to the British Mediterranean Fleet at Alexandria where she saw quite a bit of action. Once again, at the end of the war, the submarine was considered surplus to requirements and she was scrapped in South Africa. 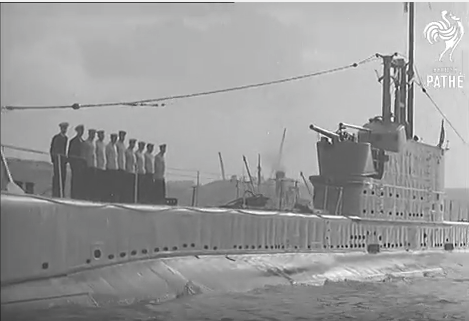 The visit of the two submarines in 1951 was to mark the 50th anniversary of the founding of Submarine Service. 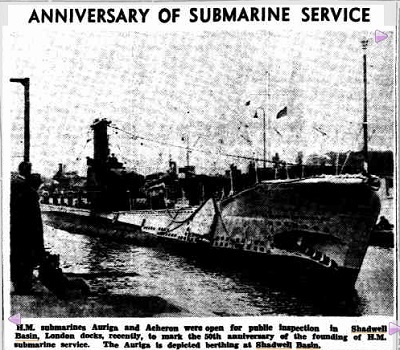 Both HMS submarines Auriga and Acheron were open for public inspection in Shadwell Basin. 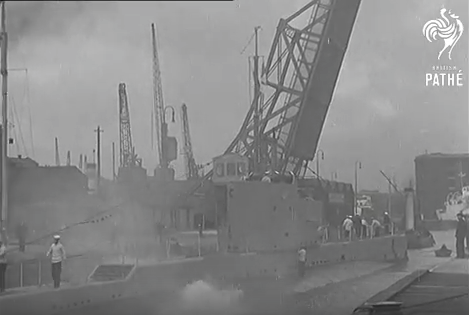 HMS Acheron was an Amphion-class submarine of the Royal Navy,built-in HM Dockyard, Chatham and launched 25 March 1947 , HMS Auriga (P419), was also an Amphion-class submarine of the Royal Navy, built by Vickers Armstrong and launched 29 March 1945. Unlike their pre war cousins, these two had a longer shelf life lasting until the mid 1970s. Seeing Shadwell Basin today, it would seem inconceivable that it was the berth for submarines, but the evidence is there is you look for it. If you would like to watch the short Pathe News Film, you can find it here.